With every other movie in MCU’s Phase 2 a much larger scale than anything in the first phase, Ant-Man felt like a nice little break. It’s the smallest scale Marvel movie released since The Incredible Hulk – pun half-intended. This also happens to be the MCU movie that might actually have the longest development cycle. Development for an Ant-Man film began as early as the late 1980’s, with Stan Lee pitching the idea to New World Pictures, Marvel’s parent company at the time. At the same time, Disney was developing Honey, I Shrunk The Kids. Stan Lee’s Ant-Man movie went into development, but halted after Honey, I Shrunk The Kids came out. In 2000, Howard Stern met with Marvel to attempt to purchase film rights to Ant Man. Later that year, Artisan Entertainment announced a deal with Marvel to co-produce, finance and distribute a film. Edgar Wright and his writing partner Joe Cornish wrote a treatment, although he believed it was never sent to Marvel. 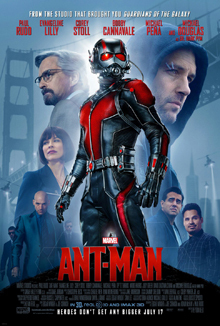 In 2006, Marvel hired Wright to write and direct the Ant-Man movie, as their original plan of independently produced films. From early on, he said he was intrigued by the story’s high concept and character. He also insisted that the movie wouldn’t be a spoof, but would be an action adventure with some comedy, and would incorporate both Hank Pym and Scott Lang. However, he put the script on hold so he could research nanotechnology for a few years. He finished the script’s first draft in 2008. Marvel started prepping the film in 2010, but didn’t give the film a hard schedule since they didn’t consider Ant-Man as one of their tent pole characters. Instead of rushing to get the movie out, they preferred to make a good script first, hoping it would be a great genre film. Over the next couple of years, they tweaked the film further, in-between working on Wright’s Scott Pilgrim vs. The World. He shot some test footage shown at San Diego Comic-Con 2012, which was very well received. It was shortly after that when Disney scheduled Ant-Man for a November 2015 release. That date would eventually be moved up to July. Wright and Age of Ultron director Joss Whedon both stated that in the MCU, Hank Pym wouldn’t have anything to do with Ultron’s creation, despite being Ultron’s creator in the comics. Wright preferred Ant-Man to stand on its own, and that forcing a tie-in with the second Avengers movie would be too much. Negotiations to hire Paul Rudd as Scott Lang began early on, and the negotiations were finished in a matter of days. Michael Douglas was soon cast as Hank Pym. Rounding out the core cast, you’ve got Evangeline Lilly playing an original character, Hope Pym (eventually becoming Wasp in the sequel), Cory Stoll as Darren Cross/Yellowjacket and Michael Pena as Luis, Scott’s Mexican friend/partner in crime. Anthony Mackie also briefly appears as Falcon. They decided to include him in the movie after seeing Winter Soldier, thinking he was just the right level of a hero to appear in this relatively low-key movie. However despite all the work Wright put into the movie, it was announced in May of 2014 that he was leaving the project, due to creative differences. Write said of the split, “I wanted to make a Marvel movie but I don’t think they really wanted to make an Edgar Wright movie.” He also said that at one point, Marvel wanted a script without his involvement. The majority of Wright’s crew also left with his departure. Adam McKay was briefly considered as a replacement director, but pulled out of negotiations out of respect of Wright, who he is personal friends with. Eventually, Peyton Reed directed the film, with McKay contributing to the film’s script. McKay felt this was perfect, as he wouldn’t be replacing Wright, but could also help Peyton, who he was also friends with. They made it clear that they were only rewriting parts of the script, keeping most of Wright’s ideas in the final film. Peyton said, “The idea, the trajectory, the goal, and the blueprint of it all, is really Edgar and Joe. It’s their story. We changed some scenes, we added new sequences, we changed some characters, and we added new characters. If you took the two scripts and held them up together they’d be very different – but the idea is all theirs.” Some of their additions included Janet van Dyne (the original wasp from the comics) and the quantum realm. Paul Rudd and Lilly also assisted with the script a bit, contributing ideas to flesh out their characters. All of these changes also caused filming delays, which caused several actors to leave or get cut out due to scheduling conflicts. The movie ended up earning $519 million worldwide, on a budget estimated to be somewhere between $130 and $170 million, although the exact numbers were never released. Nevertheless, it was a success, despite being the lowest earning MCU movie in Phase 2, and the second lowest opening for a Marvel film, only ahead of The Incredible Hulk. Then again, most of the advertisement from Marvel that summer went to Age of Ultron, and understandably so. The movie mostly did well critically, with an 82% rating on Rotten Tomatoes and an average score of 6.8/10. The general consensus was that it was a charming debut for Ant-Man, but not as strong as most of its predecessors. As for myself, I like this one. I wouldn’t call it an awesome movie by any means, but it does what it tries to do. Scott Lang is clearly portrayed as a likeable guy who made a mistake that landed him a prison sentence. It’s a well done exploration of how hard it can be for an ex-con to find work and get back on their feet. Trying to get visitation rights to see his daughter provides a fantastic motivation for him. It’s also arguably a better redemption story than Iron Man. And as a heist movie, it’s different from every other movie in the MCU. There’s also some good dramatic work with Hank and Hope Pym. The action, while on a smaller scale, is still intense in the right ways. The jokes work more often than not. I’m not sure what else to say really. I wouldn’t call it a necessary watch to anyone who hasn’t seen it before, but if you like a good redemption story, it’s worth a watch. I don’t have any specific complaints about the movie. But of the Phase 2 movies, it’s the one I’ve re-watched the least, even if it’s a better movie than Thor: The Dark World. As a whole, this is a good movie. It’s just not great. Next up is Captain America: Civil War, which kind of served as a test to see if the Russo Brothers could handle a large cast in Avengers: Infinity War. After that, it’s Doctor Strange, followed by Guardians of the Galaxy Vol. 2. This entry was posted in comics, movie review, movies and tagged adam mckay, ant man, anthony mackie, avengers, cory stoll, darren cross, edgar wright, evangeline lilly, falcon, hank pym, heist movie, hope pym, janet van dyne, luis, marvel cinemantic universe, marvel movies, mcu, michael douglas, michael pena, movies, paul rudd, peyton reed, scott lang, superhero movies, the wasp, wasp, yellowjacket. Bookmark the permalink. It’s just a straight forward, fun movie, with some great character work. There’s absolutely nothing wrong with that.